If you want to look tanned all year round, but don’t want to waste your money in salons or spas, try the Paasche TS-500T Tanning Set. With this kit, you’ll get a deep and even tan in just a few minutes. And what is more crucial, using this item you won’t get suffered from ultraviolet radiation like under the sun rays that can cause the harmful effect on your skin. Beyond that, the compact size of the set allows using it at home or take it to any place you’re going to. This tanning kit may become a practical gift for anyone who is interested in the beauty industry or wants to be tanned in winter and summer. To begin with, TS-500T tanning set is equipped with a special fan aircap that provides more powerful spraying than a standard airbrush. As a result, this aircap supplies a quick and smooth coverage as well as a fine spraying. Moreover, this small part allows you to gain control over the airbrush and make accurate sculpting of a body. As mentioned above, you can apply the item at home as well as in salon or spa. It is suitable for many applications, it is fast and efficient and allows finishing work in very little time. The Paasche TS-500T Set also includes the D500 airbrush compressor for delivering consistent pressure and thereby reaching equally spread spraying. 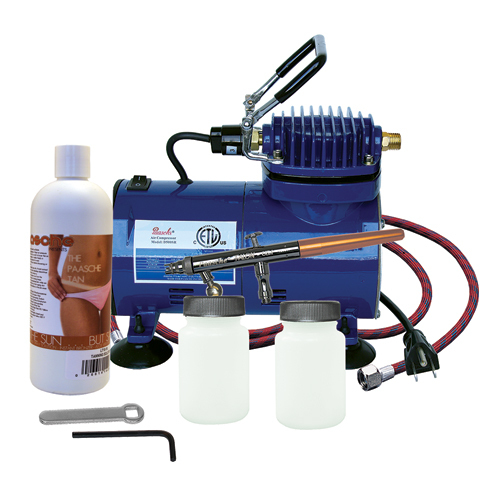 The double action airbrush comes as an addition to the package. The airbrush allows a better fading and blending together with creating thin lines, so you can accentuate some parts of your body. Besides, the airbrush has a trigger, using which you can regulate the amount of paint, turning it to the maximum or minimum. This versatile device is popular among artists as they can paint small objects likewise large ones. 16-Ounce of 10-percent DHA Tanning Solution. 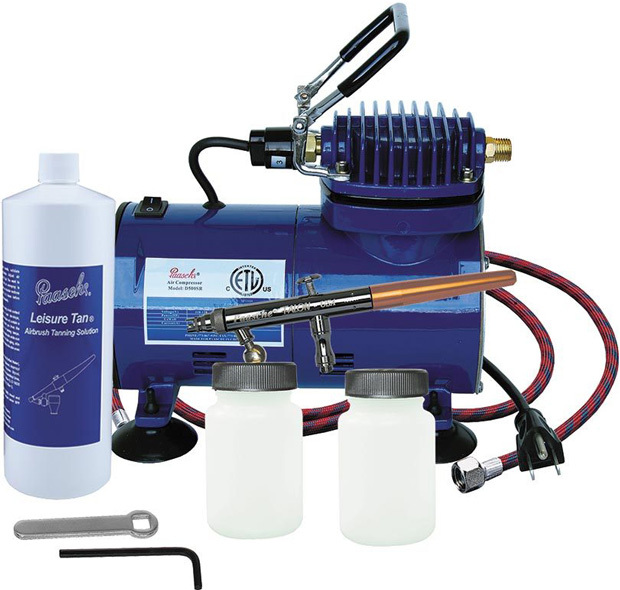 The D500 air compressor is perfect for any hobbies including tanning, tattooing, painting, and so on. The 1/5 HP motor adjusts the pressure smoothly so the paint is sprayed evenly and easily. Equally important, the compressor contains the regulator that helps to keep the pressure at a constant level and controls the inlet and outlet pressure and gas stream. It is also essential to mention that excess moisture can lead to the damage of all parts of the device. To eliminate the risk of possible break the air compressor has the moisture trap that absorbs condensation. Hence, the service life of the motor becomes longer with the help of these parts and you can enjoy your hobbies for a long period of time. Another key point is portability and compactness of the compressor, thanks to which you can put it on any flat surface. You won’t need much space to place the device as its size is the same as a medium cardboard box. Moreover, the carrying handle with the rubber coat allows for easy transportation and grants a non-slip firm grip. You should also pay attention to the quietness of the motor, and this device can guarantee the silent operation, providing 47 Db’s. Thus, it won’t emit sidetones and distract you from your work. Finally, the air compressor features the auto shutoff function which protects the motor from overheat by switching it off when the pressure increases to the max value. This feature also turns the device off when you don’t use the airbrush, conserving the energy and electricity. After the air passes through the airbrush anew, the motor will start working again. *Please, note that this product may contain chemicals (known to the State of California) that can cause cancer, birth defects or other reproductive harm. Be careful while using the item.